Okay, that’s probably too strong of a word. 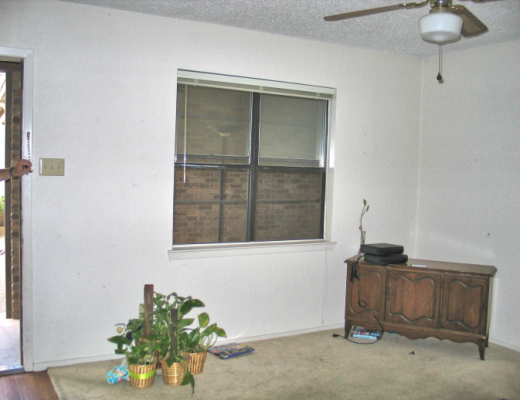 Demolition usually brings to mind images of completely gutting a room. That’s not what I’m doing here, but I am going to reconfigure the entire wall with the built-ins, so those all had to come out. And while I didn’t get it all done yesterday, I did make quite a bit of headway. 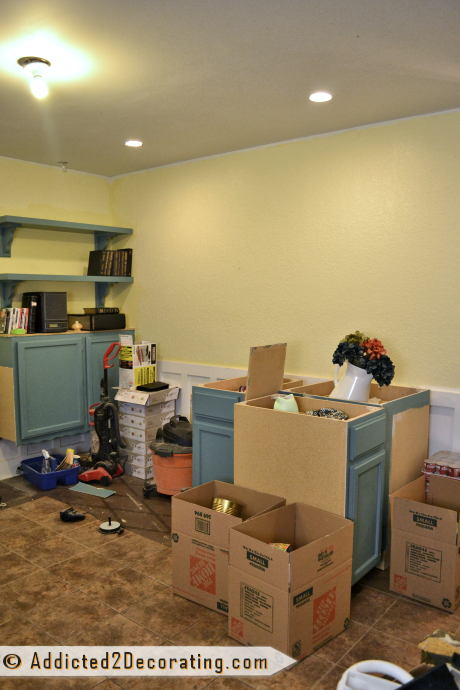 I got the middle cabinets taken out, and the cabinets on the left removed from the wall. Hopefully I can get the rest removed today, and then be ready to re-install tomorrow. Right now, the extra cabinets are just sitting off to the side. Talk about making an already-tiny home feel even tinier!!! That’s one of the hardest things about living in such a small place — finding room to actually work. Add to that equation a husband in a wheelchair, and you can imagine how stressful things can get when I’m working on projects like this. So it’s imperative that I get this done soon!! 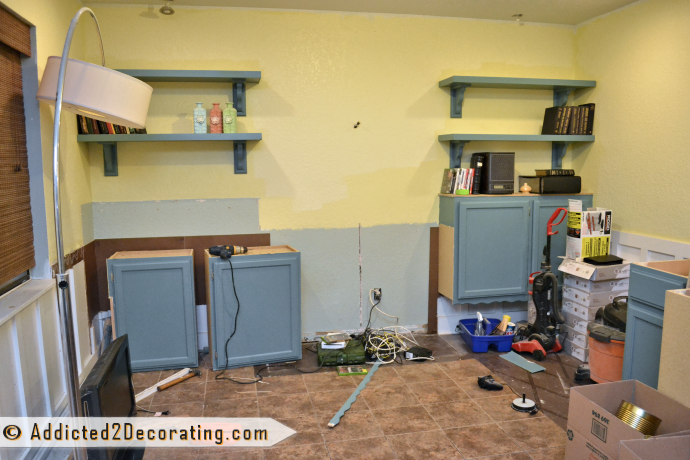 As I removed the cabinets, I also realized that I had never finished painting this wall! I originally painted this room a brighter yellow, more intense yellow, and it was just way too overpowering for this small space. So I opted for a lighter, softer, creamier yellow (called Rich Cream from Behr). But I obviously never finished painting this wall. It looks like I did all of the roller parts, but then neglected to do any of the parts that required a brush. First, the built-ins are staying. I know a couple of you said that they needed to go completely, but when you live in a place this tiny, added storage is a bonus. So they’re staying. But I think one thing that makes them be so “in your face” right now is the color. Once they’re painted white, they’ll fade into the background rather than being so dominant in the room. I won’t be re-using the base cabinets that were in the middle. I’ll save those for the house (I can certainly use them in my workroom or something), and I’ll be replacing them with more upper cabinets like the ones used on the sides that are only 12 inches deep. I’ll be building bookshelves to the ceiling on the two outer sections. The middle section will be left open (no bookshelf) for use as a television console. The two recessed lights above the outside sections will be removed, and I’ll actually find some pretty decorative lights to attach to the front of the bookshelves at the very top. This also solves a problem that I’ve had with those lights from the beginning. No matter what I’ve tried, they will not stay in the ceiling!!! I like that you are repurposing two of the cabinets and saving the third for your new home. This set up should work and I agree that a couple of coats of neutral paint will help them ‘blend in’ a bit better. Can’t wait to see what else you have ‘up your sleeve’! I know exactly what you mean that it is almost too small to work in while living in it. I’ve just bought a fixer upper and won’t be able to fix up my condo to sell until I move out. I just have too much stuff for this space. Good luck Kristie. For extra storage, maybe add the drawers on top of cabinets. I think bending that low for drawers may be awkward, and, having drawers directly under the tv may offer more convenient storage for stuff. 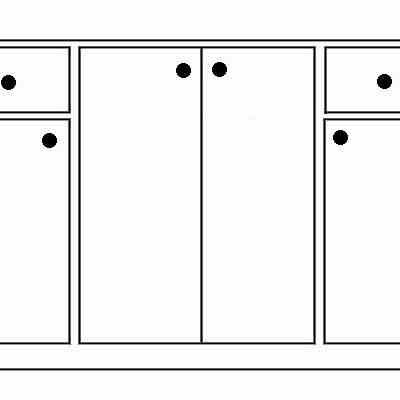 If you are using upper cabinets and you want the center to come out more, could you somehow build out the wall with a bit of wood so the middle cabinet comes out 1-2 inches? Drawers on top are a great idea. Then you could go to the floor with the center cabinet and not have the legs – everything will look like original built-ins. 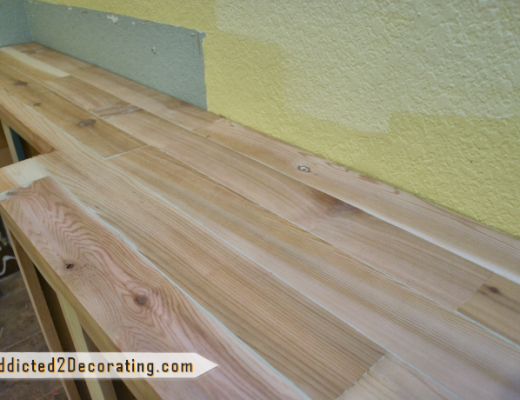 And am really excited how it will turn out with the wood countertop. It’ll blend in great with the rest of the area, ie kitchen and breakfast. If you want to project the center area a bit, just add some wood to the back frame of the cabinet. Once it’s covered with the counter, it won’t be noticable. 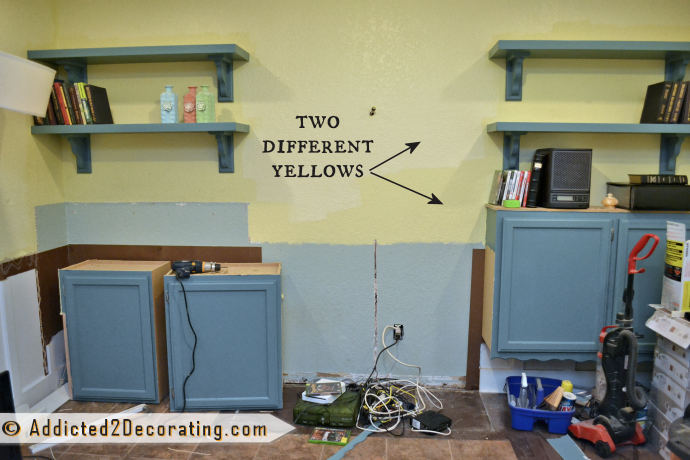 Also, if you are going to paint the cabinets, you don’t need to use wood putty. Try using some lightweight spackling to cover your nail holes and any smaller gaps – no sanding (you can use a damp sponge) and it drys super fast. I use it all the time and LOVE IT! Go Kristi! You little dynamo!!!! I don’t know, that looks like some pretty real demolition to me! I’m so impressed by your ambition. You just gave me a burst of energy I think! You really have a lot of work ahead of you, considering you do everything by yourself. I know it will turn out stunning, everything you do always looks great! Sounds like a great plan and I can’t wait to see it. Amen to Nancy’s comment. Your design eye and skill is a joy to watch. You rock! Ditto to Nancy’s comment. Your design eye and skill is a joy to watch. You rock! I just discovered your blog today, thanks to my daughter/blog partner telling me about it. I read your April 1 post, forgetting that it was April Fools, and my heart sunk. I can’t wait to have time to sit down and read/learn all about you. (We fooled our readers on April 1, too)! I agree, built in’s really add much needed storage to a small space! Can’t wait to see the updates!